Hello we are looking for a partner to take one third of these season tickets. Face value will be charged for all tickets. The tickets would be divided by draft. Postseason rights would not be associated with this agreement. Opening Day tickets are not part of this agreement. Draft would be between two-three people taking turns picking games. Open to payment options or delivery options for tickets. These tickets look right down the 3rd base line. 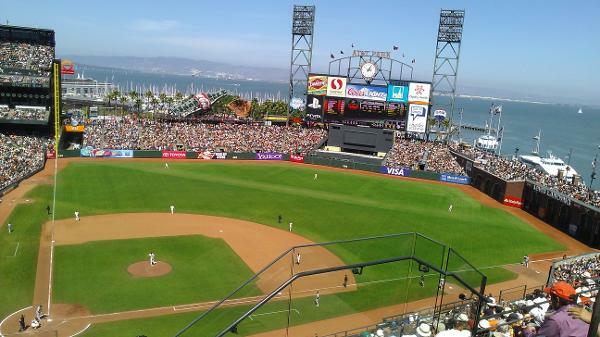 Awesome views of the Bay Bridge, McCovey Cove, etc. but close enough to the action (Row 3). The price per ticket shown on the listing is about what the average price is. Day View, is actually closer than it looks! Hello, yes sorry I have been on vacation without email access. They are still available, but a family member has asked to be included in the partnership. Would you be willing to buy 1/3 of a season instead of 1/2? Same terms as previous. I have updated the listing. Please let me know if you are interested. Hi, I'm very interested in this listing. Wondering if there are any games not included in the draft and then can you tell me the 'order' of the draft itself? (eg. one game at a time, 3 games at a time, etc.). All the games would be included in the draft with the exception of opening day. Draft order would be single games back and forth (just myself and the potential partner) picking from games out of each price bracket of the dynamic pricing. This listing has been saved by 84 people.